We have been in a huge purging mode over here, which means that my closet has undergone quite the transformation in the past month. I took no prisoners – anything that hadn’t been worn in the last six months to a year is either waiting to be sold on Poshmark (check out my closet here!) or was donated. I’m now slowly starting to add a few quality pieces back into the mix, so I scheduled a summer Stitch Fix that I received late last week. 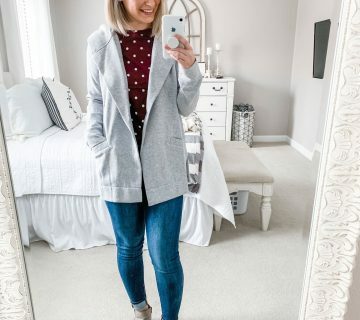 In case you’re not familiar with Stitch Fix, it is an online style service that connects you with a personal stylist based on your style profile and preferences. There is a $20 styling fee, and you receives five items in every box – whether it’s all clothes or a combination of clothes, shoes, accessories, etc. – and you have three days to try everything on in the comfort of your own home. The $20 styling fee is applied to any purchase that you make, so I always recommend keeping at least one item so you aren’t out the money. Once you decide what you want to keep, you send the rest back in the provided prepaid envelope. Easy peasy! As usual, I requested and worked with my stylist, Caitlin, on this fix. Since I’m lacking in the tops department at the moment, my note to her asked for summer tops (not tees, I have enough of those!) that easily could be worn casual or dressed up for date night. I asked for tops with sleeves – short or 3/4 quarter length, preferably – but cap sleeves are a big no because that style hits funny on my arm and isn’t flattering. I also requested my usual neutrals but with a pop of color, such as blue, thrown into the mix. Caitlin did a fantastic job of reading my note and pulling pieces that met my requirements. This probably was the most personalized fix that I’ve received yet, and I was this close to keeping everything. So, let’s take a look at the clothes! 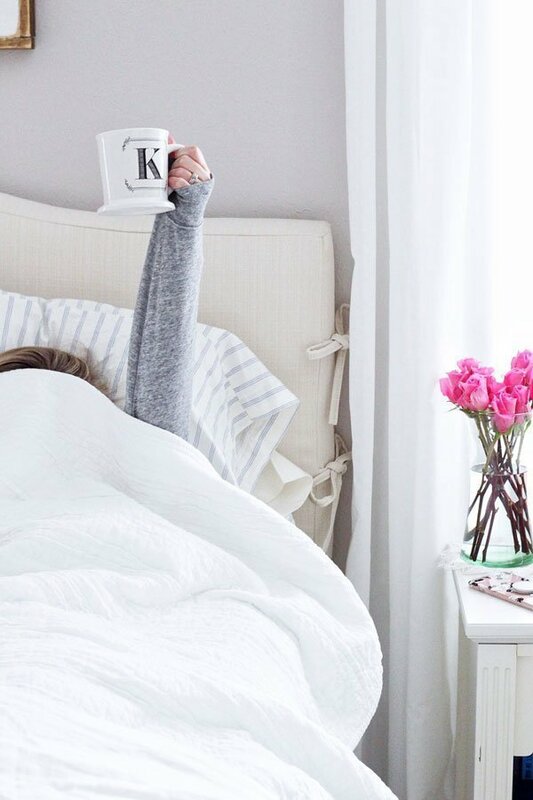 Oh, be still my heart – another super soft grey tee. It was really difficult for me to return this top, especially since Caitlin strategically put this in my fix because she read this post and thought it would be a great option for when I’m getting dressed on the fly to be ready for a house full of contractors. I was surprised that I liked the hi-lo cut – I normally just like longer tees so I can tuck the front in a bit, but I liked the overall relaxed feel of this one. And, it was as soft as a blanket. I didn’t want to take it off. 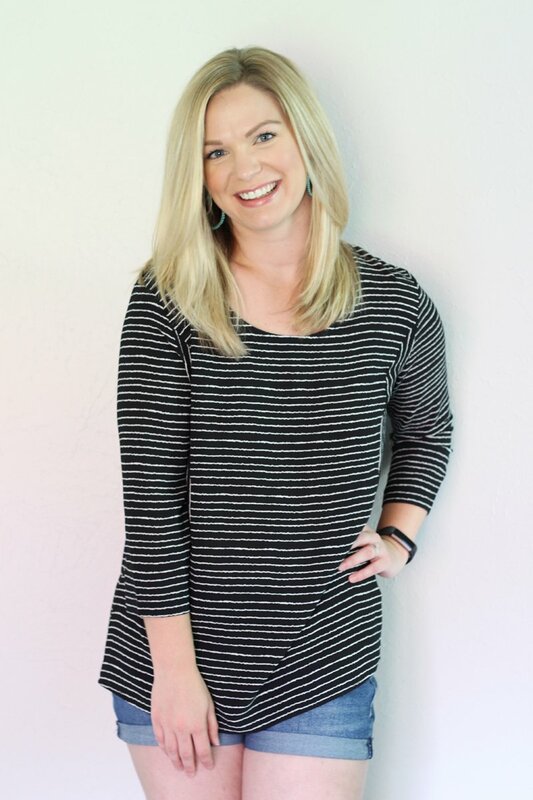 I was pretty excited when I saw this top in the box – black and white AND stripes? Duh, that’s like my perfect blouse. I did like the cut of the top, but I found it to be a bit boxy and overwhelming on my frame. I kept saying to Ryan that it looked like I was trying to hide some weight gain when I had this blouse on. I probably would’ve kept it if it was shaped differently. This was the only top/dress/tunic that I wasn’t thrilled about. First of all, I’m still not sure what it’s meant to be – is it a top? Dress? It was ridiculously long, but it was still too short for something I would’ve felt comfortable wearing as a dress. I tucked it in for the purpose of this photo, but I wouldn’t rock it like that in public as a top. The mystery continues. 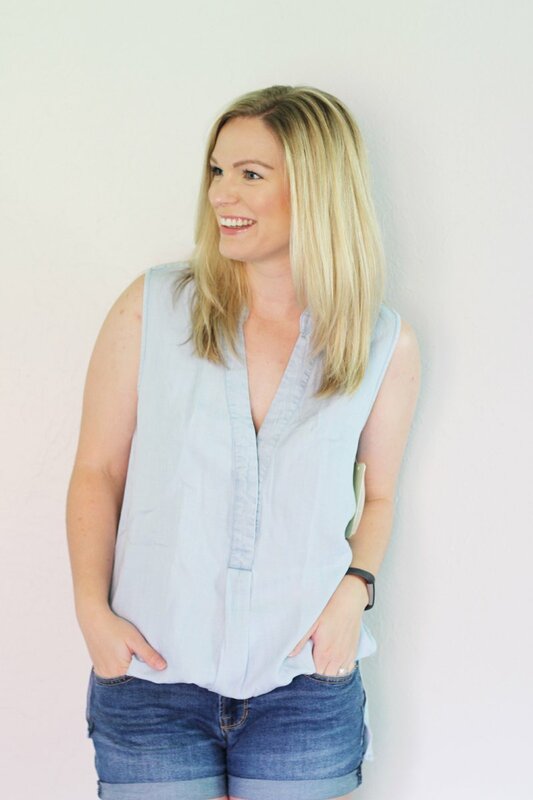 Honestly, if it would’ve been just a normal length top, I would’ve been all over it – you never can go wrong with chambray. YES! This was exactly what I was looking for when I requested this fix. A white, airy blouse with a fresh pop of blue – perfect for summer days and cool evenings. I wore this blouse paired with tailored shorts this past Friday when we attended a local wine walk on our town’s main street, and I never felt too warm in the sun or with the humidity. This will be getting lots of wear throughout the next few months. Again, another big YES. I’m a huge fan of button down tops because they are so easy to throw on with practically anything. This one fits the bill because it’s super lightweight (and sheer, so I will wear a cami underneath), and I love the floral pattern and colors. I easily can throw this on with a pair of shorts or jeans during the day, and then tuck it into a skirt for nighttime. Just like my last Stitch Fix, I kept two of the five items, which I consider a definite win. Now my wardrobe is a little freshened up for the next few summer months! 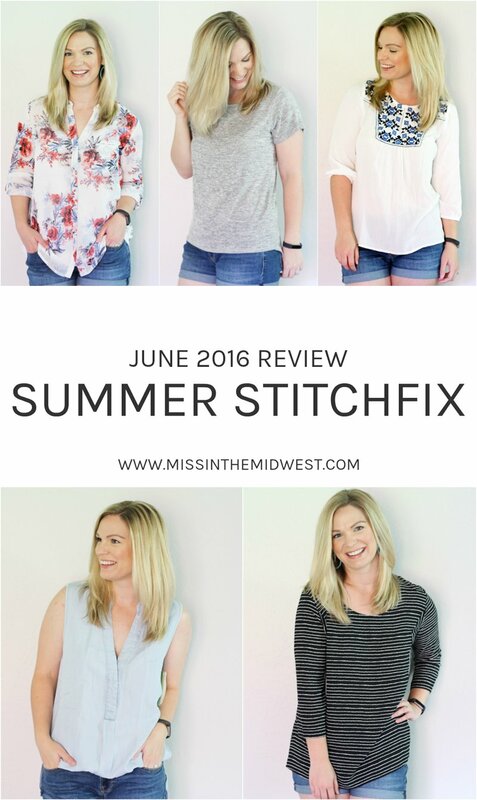 Have you had a Stitch Fix recently? Tell me about the items that you loved! 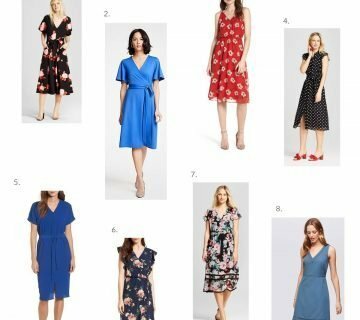 Disclaimer | As a member of the Stitch Fix Influencer Program, affiliate links are used throughout this post. That means that if you sign up for a Stitch Fix through one of my links, I receive money toward a future fix. Thank you in advance if you sign up! I agree with the picks and what you sent back! oh snap i am scared to click on your poshmark closet because i am not supposed to be shopping! i love that grey hi low tee! it looks amazing on you, but definitely not worth $44. bah. love the two tops you kept! I totally know what you’re saying – like the gray tee for example, I couldn’t really justify keeping it for $44. Pretty sure I could find something similar for less money. I didn’t know that about the $20 styling fee being applied to a purchase. That’s nice. the two tops you kept are perfect. Pieces like that are summer staples for me because they are easy but still look so polished. Love the tops you kept! Great Fix! So glad you kept both of those last two blouses. I’m all about embroidered tops and that one is too cute! I love the ones you kept – they were my favorites in the collage up top and I would have picked the same two – so cute! I think you kept the right two pieces! I’m a sucker for embroidery and that first top is sooo pretty! I liked the grey shirt as well, but I think you could definitely find something similar for a lot cheaper, you know? Although it does sound amazingly soft! I love the embroidery top, I was so excited to wear it right away over the weekend. And I agree about the grey shirt! I love the two you kept! You styled that tunic well, I couldn’t tell it was that long! Haha, thanks! It was so long. Everything looks so great on you so it would be so hard to send things back 😉 I do love the two pieces you kept though! Love the pieces you ending up keeping- perfect for summer (especially that embroidered top)! Thanks, lady! That’s my favorite, too! That’s such a bummer that the chambray top was too long! I didn’t even realize how long it was until you said that you had to tuck it in. Hopefully you can find another one that works for you! I know! If it would’ve just been a normal top I would’ve kept it. Awe, thanks girl! I appreciate that. I’m loving all the purging we are doing around here! When I saw the collage up top, I was hoping you’d keep that white blouse! It’s absolutely lovely, and looks so great on you! The floral button up too, such perfect summery tops! Thanks, friend! Such a cute top, right? I love the tops you kept! I can see why you were excited to receive this latest StitchFix, really cute stuff and I like what you picked, especially the floral top. I think you should have kept the grey tee, too! I almost did, but I think I can find something similar for less expensive! Loving that embroidered top you kept, and I can’t imagine how hard it was to return that gray tee! So many great items! The striped top is such a strange shape. 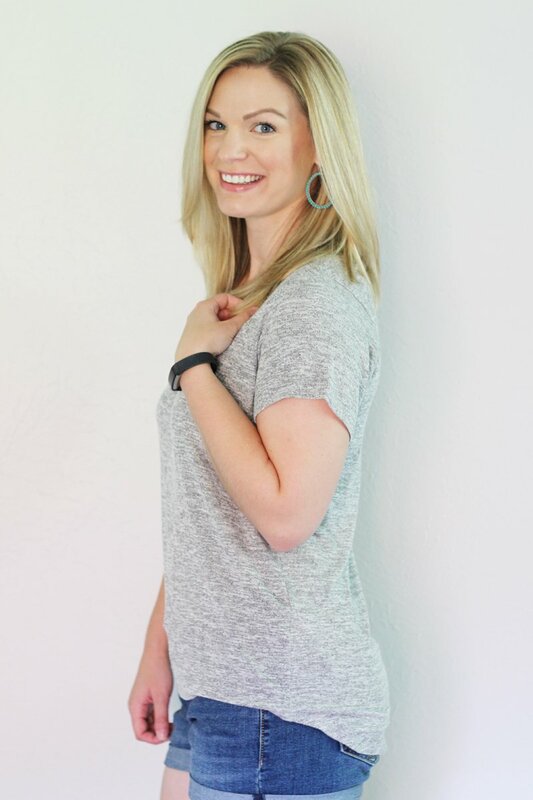 I don’t think I could have resisted the gray tee – love the items you kept, too! I’m glad you think so, too. I swear it made me look like I gained 20 lbs. Looks like you got some great stuff! So many cute tops! I love seeing stichfix posts and love the two tops you kept! The floral print is so pretty and I love how light and airy both of them look. Thanks, girl! I definitely will be wearing both a lot this summer. Exactly what I was looking for! 🙂 thanks, girl! 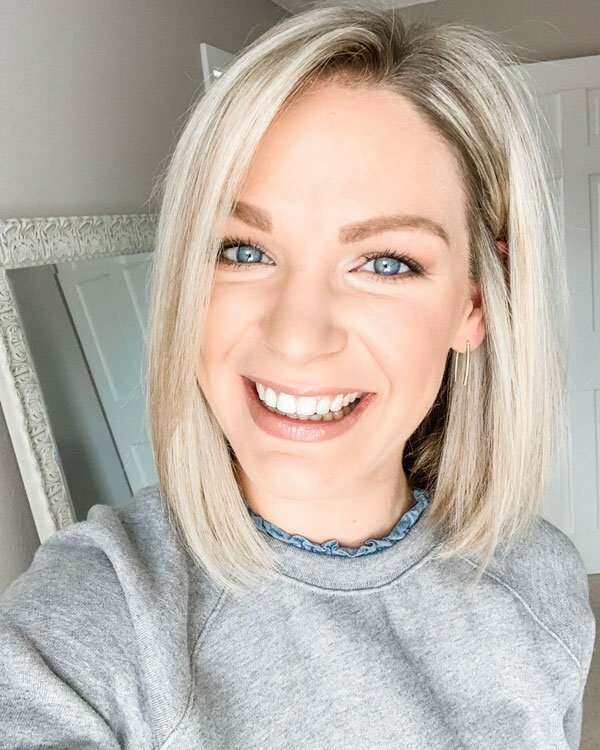 It really is the perfect top – I love it!